Hi there middle of the week! Wednesday always seems like a great day of the week to me, and today is extra good because it's Bret's birthday! It's the perfect time for me to say what a great guy he is and that I totally hit the husband jackpot when I married him. So right off I want to say Happy Birthday to Bret! Hope this coming year is extra awesome for you. 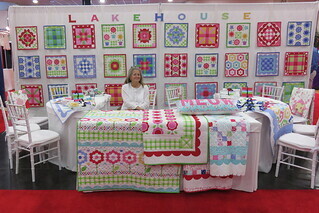 Moving on to the usual kinds of blog topics, here's a picture of the LakeHouse booth at Quilt Market! Look at that wall of mini quilts! Holly designed those blocks using her new Borders on Bolts Instant Scallops and Fence fabric, along with other fabrics in her Sunrise Studio collection. They're pretty amazing, she got started and couldn't stop. Our friend Sherri Falls stitched them all up and quilted them for her, and shipped them to the hotel. What fun it was to see Holly open the box and one by one pull out all those colorful quilts. What's great is that they illustrate just the tip of the iceberg of possibilities for the scallops, and you can count on seeing more of those in the future. On the tables we showed off quilts made from the collection and from the Pam Kitty Garden collection, both of which are shipping to stores December. The Sunrise Studio colors are compatible with the Pam Kitty colors so you'll be able to add scallops to your Pam Kitty fabric projects too! Lots more coming on that topic for sure! Anyway, you're getting a sneak peak at some future magazine quilts as well as a free pattern for an easy strip quilt.. you might remember seeing me working on it for her before market. I'm excited to show you Fog City Kitty, which is a new color way for the Pam Kitty Garden fabrics. We had so many requests for grey when shops and customers started seeing PKG we put together a quick collection starring pinks and grays, but of course you'll see the usual Pam Kitty Suspects, green, aqua and red! I hope you're going to like all the low volume prints we have too! Phew! That's a lot for one day! Better pour another cup of coffee and get busy! Have a happy day! I LOVE the new low volume prints! And I was so excited to see the old text print be re-done in so many different colors -- especially the gray. LOVE all those little quilts on the wall -- another great Lakehouse booth! The booth was gorgeous and so much fun. I am soo looking forward to your fabrics coming into the shop. Happy Birthday to your Bret. Hope y'all have an awesome day. First --- Happy Birthday to your Husband! Second -- What a great display of quilts you and Holly have there! Happy birthday Bret - like all men married to a creative women with crazy deadlines - you endure a lot. Aren't we lucky to have found the perfect for us husbands? Your booth was so colorful and fun. The new line was concise and exciting. Loved the grey. We can't wait (but know we must). Some things are just worth waiting for. Thanks to you and Holly for all you do. We love you! I need them all! SO CUTE! Wow, such lovely prints and mini quilts and big quilts! I am in love with the aqua nine patch quilt on the table with the scollops. And Holly is so adorable sitting in the middle of all the cuteness! I made a lot of quilts back in the nineties. Then a car wreck meant hand surgeries and lots of arthritis, and I just can't do it anymore. But I cherish the quilts I made. And I display them on the walls to enjoy in my little apartment. Thank you for the sneak peek. I just love how everything was set up with all those mini eye-candy quilts behind Holly. Happy Birthday to Bret! Enjoy your day! happy Birthday bret! Hope its a great day. and pan, just love the new colors and the low volumes are such a perfect day to our stash. PKM everyday!! When I saw the booth on facebook, I enlarged to look at every detail. Those mini quilts are wonderful. But I cannot wait for your new Pam Kitty Garden to make it to Strawberry Patches. Suzanne says she had plans for some cute stuff for me to make. So...Happy belated birthday to your hubby too. Can't wait for PKG! A friend and I were just talking today about it. Quilts are already bouncing around in our minds! Your booth was amazing!!! And you and Holly are both so kind! So good to see you!